There are good reasons to eat organic and locally raised fruits and vegetables. For one, they usually taste better and are a whole lot fresher. Which single piece of produce could have the greatest impact on agriculture, the environment and your family’s health, all at once? Reason #1: The average conventionally grown apple has more pesticide residue on it than any other fruit or vegetable. According to the Environmental Working Group‘s analysis of USDA data, pesticides showed up on 98 percent of the more than 700 apple samples tested (yes, they were washed). And it wasn’t just one pesticide either – apples from around the country, domestically grown and imported, were found to have up to 48 different kinds of pesticides on them. While less than the 69 types used on cucumbers, that’s still far more than the single pesticide found in sweet corn (shucked) or the 15 on oranges (peeled). Apples are commonly sprayed with Syngenta‘s Paraquat, a pesticide under scrutiny for a possible link to Parkinson’s disease. Additionally, apple growers in Michigan received an exemption for the last three years (and have recently applied again) for “emergency use” of the unapproved antibiotic kasugamycin. While not an antibiotic currently in use by humans, data on its affects on ground water and animal reproduction and development are not known. According to the USDA, in addition to the 81 percent of conventional apple orchards which spray organophosphates on apple orchards, carbamates and pyrethroids are also used nation wide (on 35% and 29% of fields, respectively). Chlorpyrifos, a chemical linked to lowered IQ and higher incidence of ADHD in children is also still sprayed on 59 percent of apple orchards in the U.S., endangering the general public and those children living in rural areas. Not only is apple pie American, so are apples. 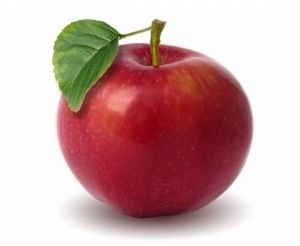 The third most consumed fruit in the U.S. (next to oranges and grapes), apples generate $2.2 billion a year. 350,000 acres in the U.S. are dedicated to growing the fruit, and apples can be grown in all 50 states, although 60 percent of them are currently grown in Washington. Yet organic orchards currently account for only 6 percent of apple acreage in the country, even though organic apples are one of the most popular organic fruits. Reason #5 Organic apples don’t cost an arm and a leg, and are a great snack. The cost of an organic apple can be as high as $2.99 a pound and as low as $.99. And at about 1/2 of a pound a piece – that means the most expensive organic apples you can buy would run you only $1.50 a pop. Eating five of them a month would be only $90 a year – a cost most American households can bear. (Although this is more apples than most households currently consume – a discussion for another article perhaps). An apple a day, it turns out, can do far more than just keep the doctor away. Well presented facts! I had no idea about most of these stats, good to know!